address specific topics readers want to dive in (often these will not be data-people, they would be new to my blog, probably coming after googling a specific questions e.g. 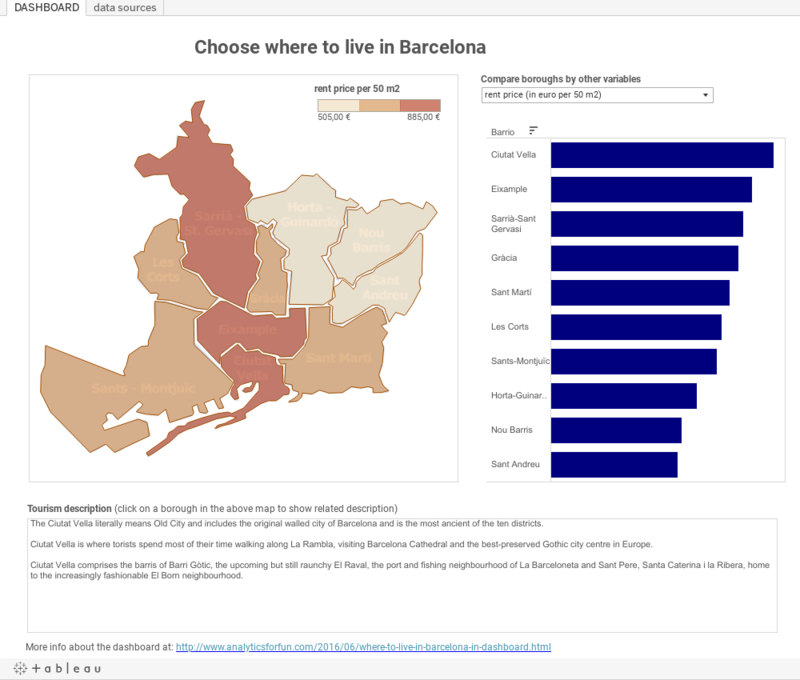 "which are the best boroughs to live in Barcelona?"). showcase data visualization tools and best practices to present your data (these are data-people, yes you my regular readers, you might like to see a tool in action). I will mainly make use of Tableau Public to build and share the data visualizations. Tableau Public is basically the free version of Tableau Software. You can take advantage of the great analytics power offered by Tableau, make amazing visualizations quickly and share them on the web (remember that once published they are all freely accessible to everybody). There is a huge community of people sharing stories via Tableau Public (take a look at the Tableau Public Gallery here) and it is very popular in data journalism. A map showing how Barcelona it is divided by its 10 main boroughs ("distritos"). The colour scale indicates the average renting price: the darker is the colour and the more expensive is renting in that area. If you click on any of the borough, the correspondent tourism description will show up in the below section. A vertical bar chart which lets you compare boroughs by different variables using a drop-down filter. A bottom section containing the tourism description of the borough selected in the map. In the "data sources" I provided the sources of data. Below is the viz, I hope enjoy it. Any issue, you can view it here in my Tableau Public profile. I know it's quite a simplified model in terms of variables considered. Choosing where to live is a complex decision and you'll probably take into account many more factors like proximity to your job/school, public transports, nightlife, etc. etc. But, like I did in other previous posts about dashboards, I like proof of concepts (POC) and this wants to be mostly a proof of concept. 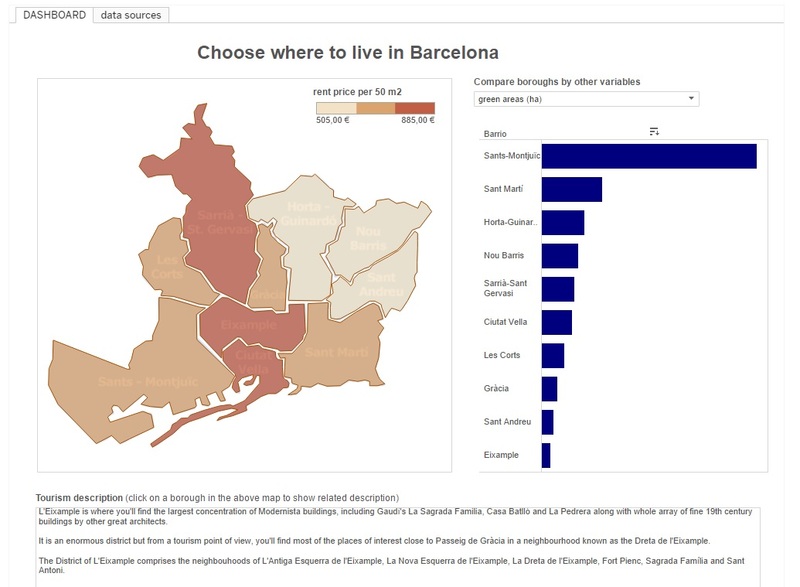 Can an interactive data visualization help you choose the best place to live in a city? I think so. At least it can narrow down your focus in your initial search for a house, especially when you are new to it. Often you need to check out many websites before you can get an idea of how a city is structured. A dashboard equipped with relevant information can help you explore a city much more quickly. We need more dashboards about cities! Why Barcelona? It´s one of my favourite cities. I have been to Barcelona 5 times, always as a tourist, and if you ask me which city would you like to move in the future.... guess which one? PS: would you like to enrich this dashboard with more relevant info? Feel free to suggest other variables and sources of data and I will try to include them.